Joshua Battistin of Orlando, Fla. is one of more than 30,000 students considering options to continue their education following the abrupt closure of the for-profit technical college. The fall semester has just begun on most college campuses, but tens of thousands of students in 38 states were told Tuesday that, instead, their college is closing its doors. In a press release, ITT Educational Services announced it would close all campuses of its ITT Technical Institutes. The for-profit college system has become a household name over the past half-century. The company blamed the shutdown on the U.S. Department of Education, which had stepped up oversight of the school and recently imposed tough financial sanctions. The concerns about ITT involve recruitment and financial practices. For several years now, a group of roughly a dozen state attorneys general had been looking into allegations that ITT misled students about future job prospects and might have accepted students who weren’t qualified for the technical programs they offered. The company hasn’t been convicted of wrongdoing; nevertheless, the Education Department recently levied a series of financial sanctions against the company, and the school’s accreditor found it out of compliance. Things came to a head last month when the Education Department essentially cut ITT off from the federal financial aid program. New students would not qualify for federal student loans or Pell Grants, money that is essential to the operation of for-profit colleges. 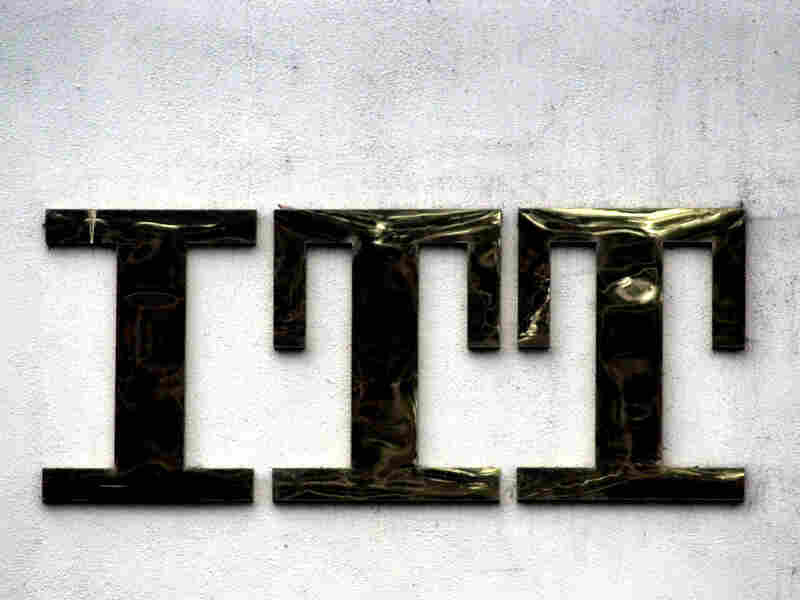 After trying and failing to sell its many campuses, ITT resolved that it had no choice but to cease operations. Some 35,000 students now face a difficult choice. The Department of Education will allow them to walk away from their outstanding student loans or transfer all the credits they’ve already earned to a similar program — but not both. Speaking to reporters Tuesday, Education Department Undersecretary Ted Mitchell said all students who have been enrolled at an ITT campus within the last 120 days are eligible to apply for what’s called a “closed school discharge” of their student loans. Up to $500 million in outstanding loans could be erased. At the same time, Mitchell said that “we hope many students will look for transfer opportunities.” To that end, the department is working with community colleges located near ITT campuses, encouraging them to accept ITT students and their credits. Veteran AP reporter Kathy Gannon discusses her experience covering the war in Afghanistan from the beginning, and describes what has changed over the last 15 years. After Sept. 11, the difficult conversation began about compensating survivors and assessing the long-term value of a lost human life. It fell to Special Master Kenneth Feinberg to administer it. In northeast Pennsylvania, along the edge of Lake Erie, you’ll find the city of Erie. There, the superintendent of the more than 12,000 student district has forwarded a plan that’s causing a stir — calling for leaders to consider shutting down all of the district’s high schools and sending students to the wealthier, whiter, suburban districts. Erie’s schools have been pushed to the brink after six years of deep budget cuts, and he believes the children in the city’s district — which predominantly serves students of color — are being systematically shortchanged. That’s in part because urban school districts in Pennsylvania face a particularly brutal logic. They serve the poorest, most needy students. Yet, when it comes to state funding per pupil, most of them don’t make the top of the list. Even though Erie is one of the most impoverished districts in the state, and has one of the highest percentages of English language learners, the district currently receives less per-pupil funding from the state than hundreds of other districts. Excluding pension costs, per-pupil spending in Erie is less than it was in 2008-09. “If our students would need to attend schools in other districts in order to have some sort of equity, then that may end up being the most ethical and moral decision,” Badams says. The signs of Erie’s fiscal distress would be hard for students to overlook. Many of the aging school buildings have crumbling infrastructure. Books and technology have lagged behind the times. Stevens, who’s white, was one of a handful of students gathered in the school library at the end of the school year to talk about the plan to bus students out to those higher income districts. “Everybody thinks it’s a ghetto school, or that the people that go here are dumb, or bad,” Whitney Henderson says. She’s a year younger than Stevens and African-American. She worries about what Badams’ proposal would mean for her. Genene Mattern’s children attend school in the Millcreek School District, in Erie County, one that might absorb kids from the city if the closure plan goes into effect. “I get a little upset when I hear other parents who are against it totally, because they don’t want ‘Erie city kids,'” says Mattern. And any of the superintendents in outlying districts, including Millcreek, have said much the same. So, too, has Sean Wiley, a Democratic state senator who represents Erie and the immediate suburbs. But the proposal has been the subject of vitriol on social media, where some parents have disparaged Erie students and parents. There’s a growing body of educators and researchers who say that figuring out the logistics of this proposal would be well worth the extra effort. At their core, integration plans are a tying mechanism, says Kimberly Quick. “If the outcomes and the benefits that a school can provide to the son of a janitor are tied to those of the son of a congressman, then they are more likely to get those resources, right?” asks Quick, a policy associate at the Century Foundation, a D.C.-based think tank that advocates for school integration. Its research finds that integration, when planned and done well, has historically led to major boons for low-income and minority students. Century says this happens, in large part, based on the superior quality and quantity of resources and teachers are generally made available to richer and whiter schools. “And that’s how we need to frame this, instead of making it sound like something magical happens when black kids sit next to white kids,” says Quick. Century also argues that suburban parents don’t need to worry about a negative effect on their children. “There’s no evidence that points to that,” Quick adds. 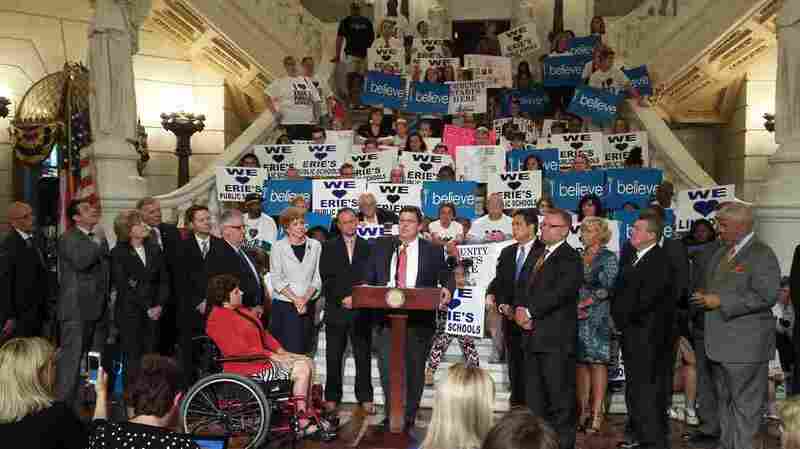 The issue in Erie is even more complicated because of Pennsylvania’s education funding policies. For most of the past 25 years, the state has distributed money without a rational, student-based formula. So although Erie is one of the state’s most challenged districts, the state sends more money per-pupil from its main pot of cash to most other districts in the county — including wealthier ones, with less pressing needs, that already have an easier time raising local funds. Polito used to have a similar job in North East, a rural district in Erie County. Drawing a comparison, he says last year Erie spent $6,000 dollars on its 18 libraries. It’s examples like these that has Millcreek parent Genene Mattern completely supporting the stand that superintendent Jay Badams has taken on closing the city’s high schools. “People need to get mad. People need to get loud, because the more you just sit and let it happen, I think the more they figure, ‘well, they’re okay with that,'” she says. The Erie district did receive a modicum of relief in the state budget that recently passed, including a $3.4 million boost in basic education funds, and a one-time $4 million dollar emergency supplement. But the systemic issues will persist, and Erie’s finances are slated to be in the same straits by the end of the school year. Would Erie’s crisis even be happening if it was a majority white district? Erie, and many other urban districts with a majority of students of color, would see a windfall if state leaders chose to implement the state’s new student-weighted funding formula more aggressively. But they haven’t. 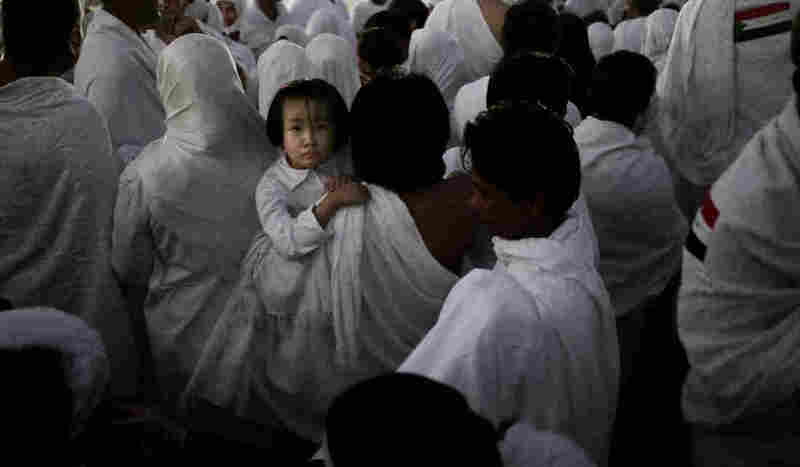 More than a million Muslims have embarked on the yearly Hajj pilgrimage to Mecca, Saudi Arabia, after last year’s holy event was marred by a deadly stampede that killed hundreds and stoked tensions between Saudi Arabia and Iran. 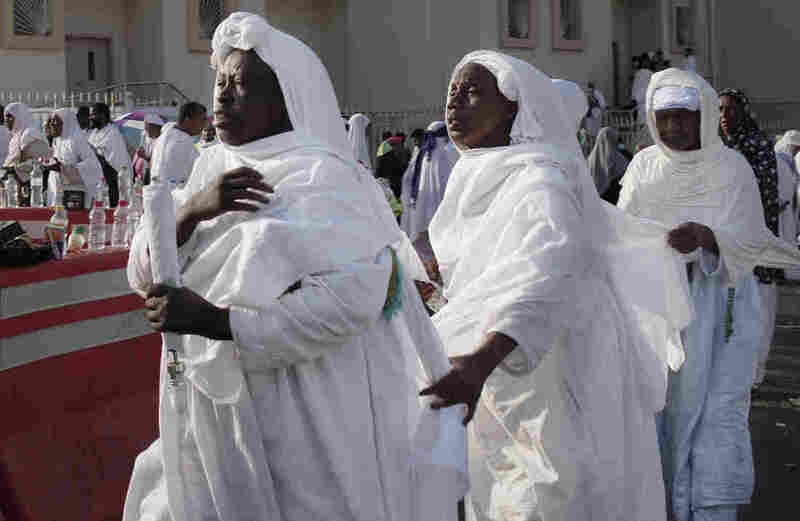 The sacred Muslim pilgrimage takes place over five days — and on Sunday, it reached its climax, as NPR’s Alice Fordham tells our Newscast unit. 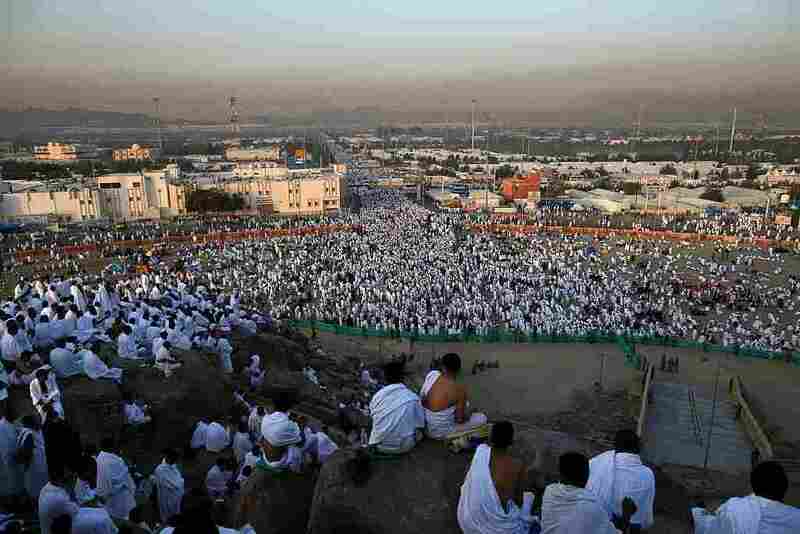 “Beginning at dawn, the masses congregated to pray on the mountain where they believe the Prophet Muhammad gave his last sermon,” Alice reports. 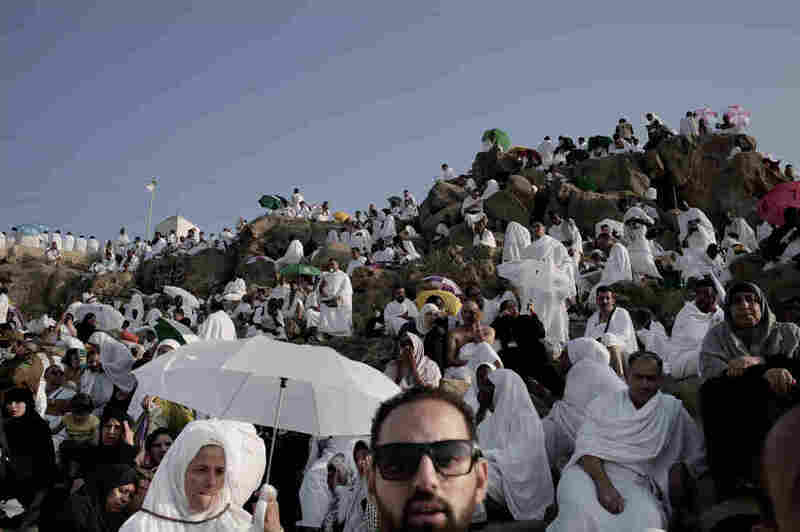 Prayer on this mountain, called Mount Arafat and located 12 miles east of Mecca, “is believed to offer the best change of erasing past sins and starting anew,” as The Associated Press explains. 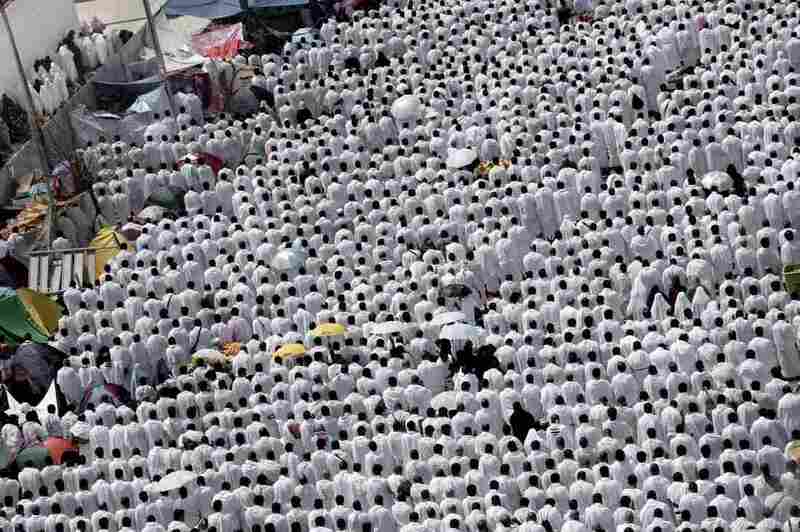 This day “is the one time during the hajj when roughly all pilgrims are in the same place at the same time,” the wire service adds, and the pilgrims hail from more than 160 countries. “All Muslims on Earth wish they could have been here today. 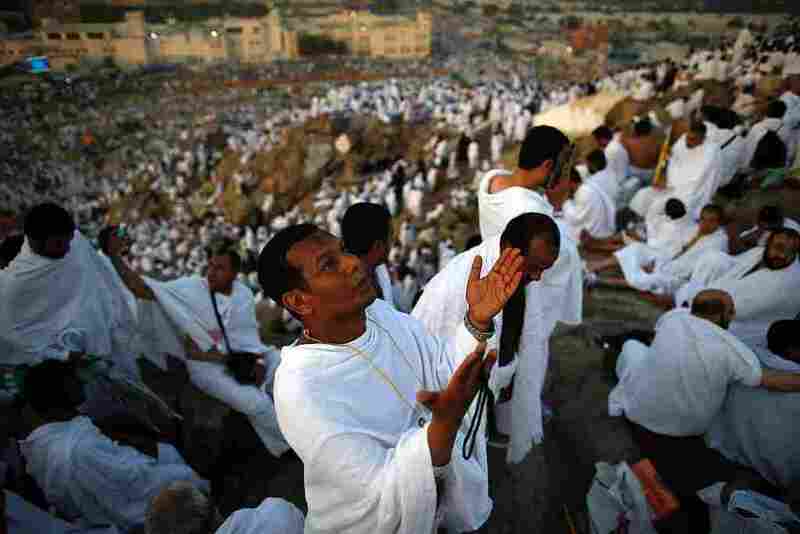 Thanks to Allah for enabling me to be here,” Egyptian pilgrim Mahmoud Awny told the AP. The pilgrimage to Mecca, the Prophet Muhammad’s birthplace, is a religious obligation in Islam. Able-bodied Muslims must do it at least once in their lives, and it’s one of five central pillars of the religion. The spiritual experience is also intensely physical. Iran, which is Saudi Arabia’s regional rival, actually banned its citizens from participating in this year’s pilgrimage. “The issue of safety of pilgrims goes to the heart of the Saudi government’s legitimacy,” as Vali Nasr, author of The Shia Revival, tells Morning Edition. He says that Iran’s assertions that Saudi Arabia was not able to secure the pilgrimage and then did not properly care for the victims is meant to put pressure on the Kingdom. The Saudi government has “introduced new safety measures for this year’s hajj, including electronic wristbands for pilgrims and more surveillance cameras and other technology for improved crowd control,” as The Wall Street Journal reports. When Does A Friendship Become An Affair? Dear Sugar Radio is a weekly podcast from member station WBUR. Hosts Steve Almond and Cheryl Strayed offer “radical empathy” and advice on everything from relationships and parenthood to dealing with drug problems or anxiety. Today the Sugars take on two questions relating to affairs — emotional and physical. One writer is having an “emotional affair” with a married man who is trying to repair his relationship with his wife. The second comes from a woman who had an affair but wants to delay a divorce to keep health insurance. I have been pulled into an emotional affair with an older, married friend. He and I became close over the last two years. What I initially saw as friendship has grown into intimacy. He has a troubled marriage that’s been on rocky ground for a long time, and it has survived his infidelity. My friend and his wife have children and are trying to make their marriage work. While my intentions are not sexual, I care very deeply for my friend, and I still crave the closeness and emotional intimacy of our relationship. Is there a way to salvage this friendship in a healthy and respectful way? Or do I need to politely bow out before I create more trouble in an already turbulent life? Steve Almond: It’s unclear to me why you are referring to this relationship as an “emotional affair” rather than a “friendship.” My suspicion is that there isn’t sexual alchemy necessarily, but there’s something that feels secret and covert and occupies a kind of emotional, intimate space more appropriate for a partner. You know a friendship is over when you’re talking more about somebody than to them, and you know a marriage is really in trouble when your partner isn’t the person with whom you have the deepest, most intimate conversations. You are in a relationship with this guy that occupies the emotional energy and attention that should be going toward him healing his relationship with his wife, which is what he says he wants to do. My hunch is that your hunch is that you need to step back from this friendship until he figures out whether his marriage is going to be healable or not. Cheryl Strayed: I think you know the answer, TIOMH. You don’t sign a letter “Totally In Over My Head” unless you’re totally in over your head. You’re in a relationship that doesn’t feel right to you, and so, you need to bow out. We all crave closeness and emotional intimacy, and you can find that in a relationship that feels right. So you need to let this one go. I have an agonizingly American dilemma. After I had an ugly and protracted affair, my husband decided that our marriage wasn’t tenable anymore. We’ve been together for eight years and married for two, but for the past four months, we’ve been living separately. Despite my many pleas to reconcile, I’ve finally begun to accept that my husband no longer views me as his life partner, for reasons that are extremely valid. He has drawn up very equitable divorce papers and has displayed a lot of patience about me wanting to take some time to sign them. I’m currently employed at a prestigious publication as a freelancer; I’ve been working for them for more than a year, but I don’t yet have employee benefits — most pressingly, health insurance. Though I’ve gotten some vague promises that I am “next in line” for a staff position, there’s no indication of when a move in that direction might happen. I’m currently reliant on my estranged husband’s health insurance to control an intense anxiety disorder — and ironically enough, my distraught feelings about our split. While I’m not ready to give up on him, I understand that he no longer wishes to be married to me, and I want to set him free to pursue someone who can be more faithful to him and can appreciate him fully. On the other hand, divorcing him will mean losing my health insurance, and I don’t want to be saddled with crippling financial burdens in order to maintain my precarious mental health. Is it moral to delay the divorce process until I can secure employee benefits? Should I be looking for another job, even though the stability of a job I love is one of the few bright spots in my life right now? Help! Cheryl: It is moral for you to delay your divorce to keep your health insurance benefits. But to me, that’s not the question — it is, does your husband want to do this? It might be a good idea to get really specific about what amount of time would allow you to figure out this health insurance situation. You know, the sad thing about a divorce is that at the end of the day, it really is a business negotiation. These health insurance questions are really common, sadly, in this society where we don’t all have access to health insurance. And so, I think it’s a reasonable claim to ask him to delay the divorce. Steve: I think the larger crisis that’s underneath all this is that your life is in chaos right now. And it feels deeply disrupted by the end of the marriage, by your feelings of responsibility, by your desire to be back with this person, and not incidentally, by your life as a freelancer. So in asking him, you need to be sure you’re not further casting yourself into the role of somebody who’s living a provisional, disrupted life. Because it sounds like that anxiety disorder you speak of is exacerbated by this feeling that you don’t really have a stable base at home or at work. You can get more advice from the Sugars each week on Dear Sugar Radio from WBUR. Listen to the whole episode to hear from writers dealing with separation from significant others and conflict over pets. Have a question for the Sugars? Email dearsugarradio@gmail.com and it may be answered on a future episode. 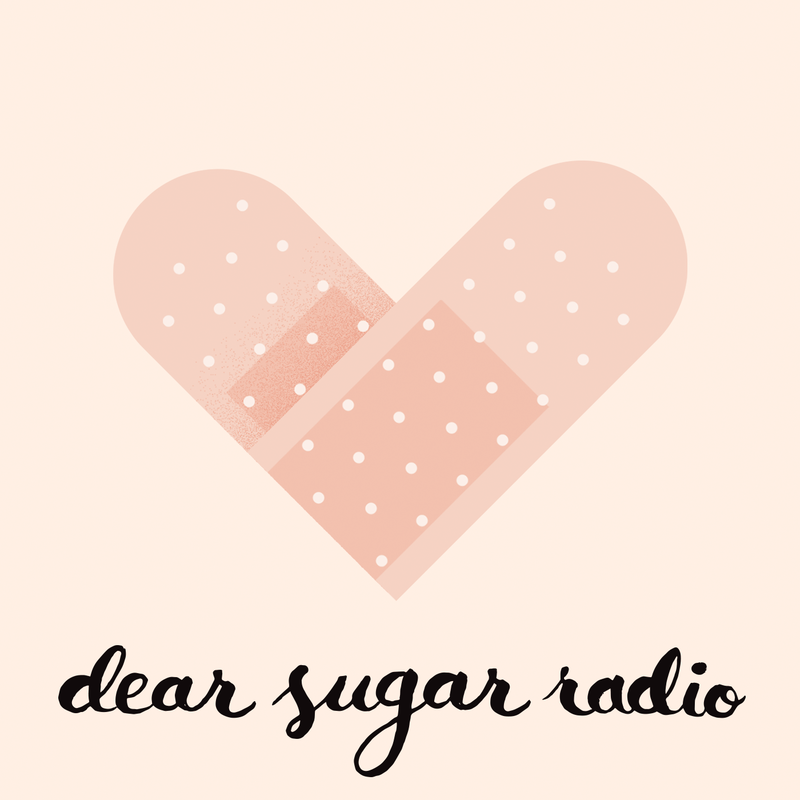 You can also listen to Dear Sugar Radio on iTunes, Stitcher or your favorite podcast app. Presidential candidate Hillary Clinton felt “overheated” during a commemoration ceremony for the victims of the Sept. 11 attacks and left after an hour and 30 minutes, according to a campaign spokesman. “During the ceremony, she felt overheated so departed to go to her daughter’s apartment, and is feeling much better,” spokesman Nick Merrill said in a statement. She departed suddenly, as NPR’s Tamara Keith tells our Newscast unit. “Her traveling press corps was not taken with her and didn’t know her whereabouts for quite some time,” she says. According to the National Weather Service, the temperature was 79 degrees with 54 percent humidity at 9:51 a.m. in Manhattan. Donald Trump also attended the commemoration. 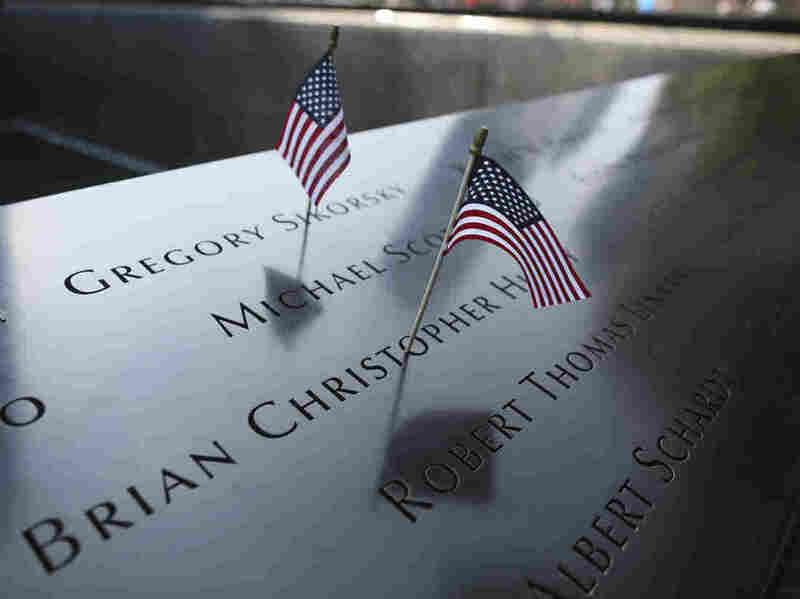 The name of each of the nearly 3,000 victims of the Sept. 11 attacks are being read at a ceremony at the Sept. 11 memorial plaza, at the World Trade Center site in New York City. This marks the 15th anniversary of the attacks. Family members are coming forward to name and honor their relatives who died at the World Trade Center, the Pentagon and on Flight 93. The event is also commemorating the victims of the 1993 World Trade Center bombings. A commemoration ceremony was also held Sunday morning at the Pentagon, where President Obama spoke. This demonstration comes amid growing momentum in Spain against the centuries-old tradition, as reporter Lauren Frayer tells our Newscast unit. 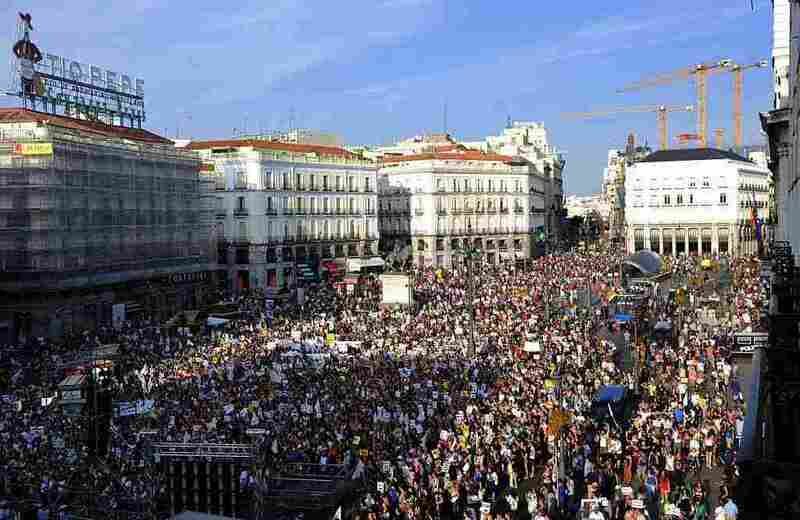 It was organized by Pacma, an animal rights political party — and the group says it was “the biggest anti-bullfighting protest to date,” as Reuters reports. Supporters of bullfighting consider it an inexorable part of Spanish culture — and activist Jorge Rodriguez tells Frayer that it’s hard to change people’s minds. “Our traditions are linked to our history — to the weather, to the culture, to the people. It’s a lot more than hurting animals for the sake of hurting animals. It’s rooted — and that’s why it’s so difficult to get rid of it,” Rodriguez says. There have been signs of change recently. This week, “a popular festival that used to involve spearing bulls as they run through the streets will go on — but without the bulls being killed. That part has been banned,” Frayer reports. According to the Associated Press, “at least 17 Spanish cities and towns have cut municipal funding for bullfights and bull runs, or passed legislation condemning or banning it since the new leftist party Podemos won its first seats in local and regional elections a year ago.” The Catalonia region banned bullfighting altogether in 2011, as NPR reported. Fewer and fewer Spaniards support the pastime. “An Ipsos Mori poll from January, carried out for animal welfare organisation World Animal Protection, found that only 19 percent of adults in Spain supported bullfighting, while 58 percent opposed it,” as Reuters reports. Bullfighting does have powerful supporters, including Spanish Prime Minister Mariano Rajoy, as the BBC reports. It adds that fans, which are known as “aficionados” have also recently rallied in favor of the tradition. Plastic water bottles, brown medicine vials, and Styrofoam coffee cups wash up on the beaches of Taiwan’s Kinmen Island. This is the daily tide of garbage from the world’s most populous nation, just one mile across the channel. But it wasn’t always garbage that came floating across from mainland China. Communist troops from China’s Red Army stormed this beach in 1949. Thousands of Chinese soldiers who tried to take this island from Taiwan were massacred. “You see that well? 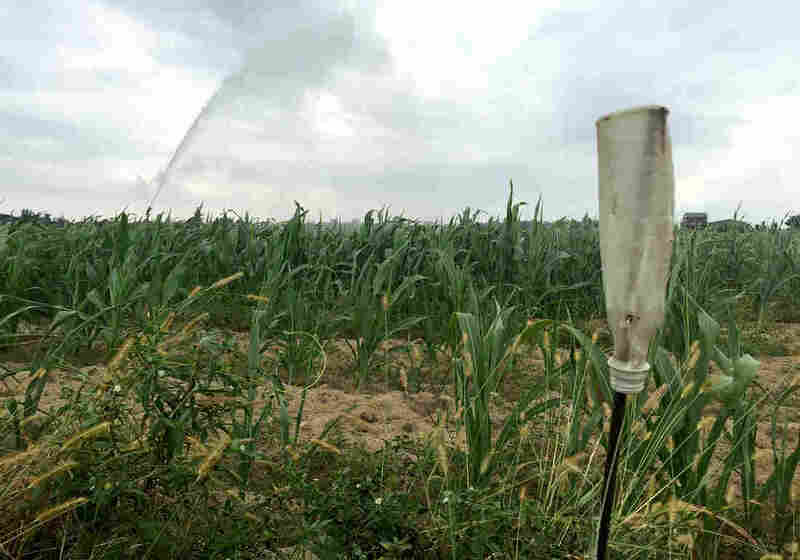 It’s full of their bodies,” says Song Li Fa, a former Taiwanese soldier who drives his beat-up van through fields of corn and ancient water wells beyond the beach. Song stops the van with a clicking of a parking brake, steps out of his car, and walks through the corn, his rugby-player frame towering above the lush rows. More than 100 plastic tombstones rise above the corn in the distance. Kinmen Island is heeding Song’s message. Decades after a bloody battle made the island, also known by its historical name Quemoy, the frontline of a long-standing cold war between Taiwan and China, relations are thawing. 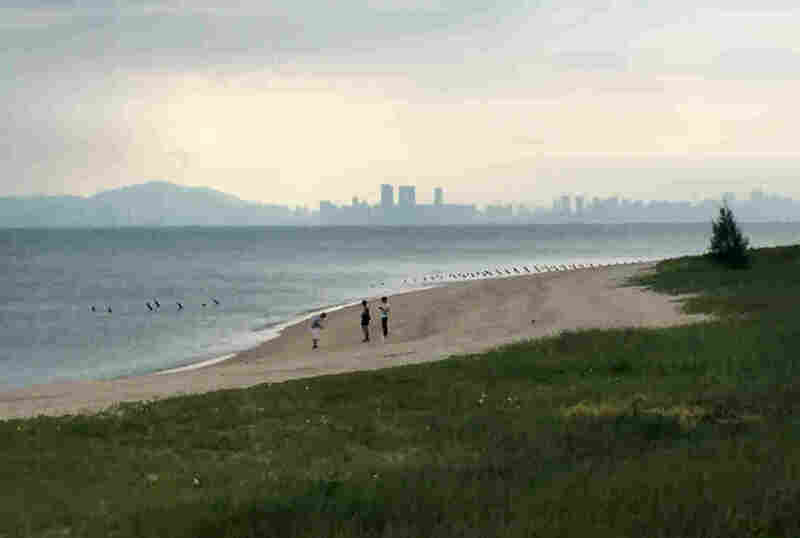 Its population of 130,000 belongs to Taiwan, but its island motherland is 120 miles away, and the steel and glass towers crowding mainland China’s city of Xiamen beckon to residents of a largely rural island. At Kinmen’s only harbor, hundreds of Chinese tourists disembark a ferry from the mainland, looking for an escape from the big city in the island’s rolling hills, vast beaches, and ancient villages. He says he’d like to see the island’s population reach 300,000, more than doubling the current number. Taiwanese laws make it nearly impossible for mainland Chinese to own land on Kinmen Island. But Wu wants to change that. He thinks China’s government should also be able to buy property here, too. 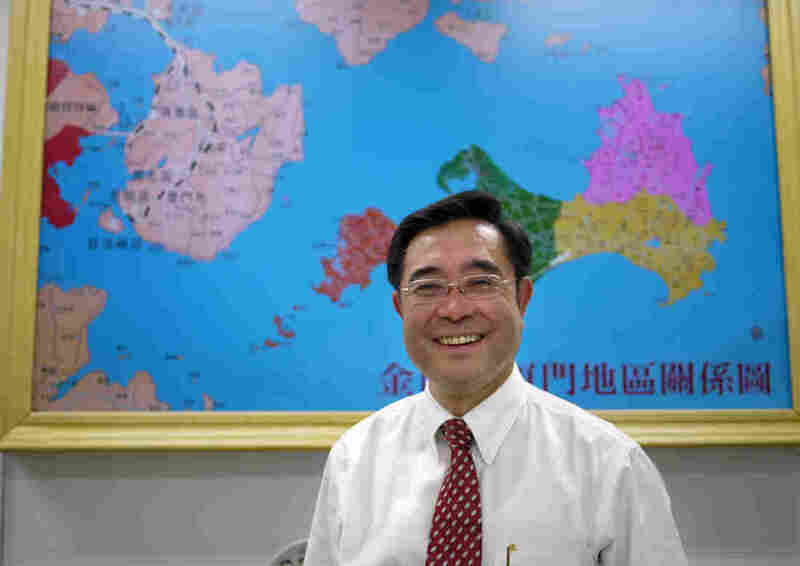 He supports a bridge from Kinmen to the mainland, a cruise ship terminal for Chinese ships, and he wants to allow mainland Chinese to use their own currency on the island. Taiwan’s national government has rejected all of these proposals. But Deputy Magistrate Wu’s constituents are conflicted. At a bohemian restaurant inside the island’s biggest town, Jincheng, ukulele instructor Xu Yi Teng, 26, wants to keep the mainland at more than an arm’s length. Across the island in the ancient village of Shanwai, local culture is on display each morning as residents burn incense and fake money at a neighborhood Buddhist temple. Yang Yunu says she’s not scared at all about an invasion of wealthy Chinese. But many islanders’ opinions about the mainland are more nuanced. Li speaks from experience. He lived through an era when Kinmen and the mainland fired bombshells filled with propaganda leaflets at each other every — on the evenings of the odd days of the calendar — from 1960 to 1978. 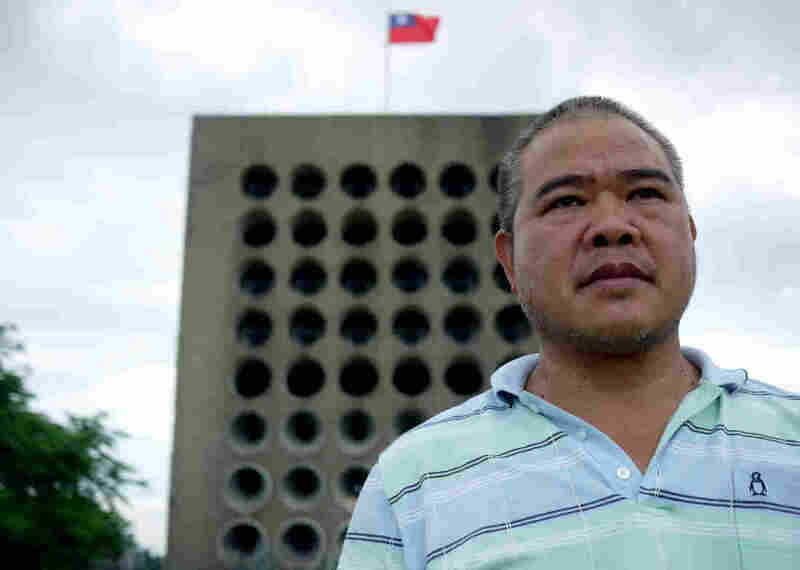 A relic from that bygone era stands proud on the island’s western coast: a three-story tall speaker system that blasts Taiwanese songs and propaganda towards the mainland at ear-piercing decibels. A voice proclaims, “Stay healthy and long live democracy!” in Mandarin before launching into a popular ballad from the 1970s. Below, Song Li Fa, the burly man who gave a tour of the mass grave of Chinese soldiers, stands and smiles. The song reminds him of when he was a soldier decades ago.